Finally the first real outfit fall outfit post of the year is up on the blog! 🎉 Fall undeniably has settled in and you can not only feel that in the cold crisp air, but also in the nature – especially in the golden red trees and bushes. So with that being said I declare the fall outfit series open! 😀 I am wearing one of my all time favorite coats – a camel colour coat from New Look (alternative here), a more than five years old blouse, but it’s still very near and dear to my heart and I’ve had countless outfit posts with it. I am also wearing new additions to my wardrobe – faux suede button down skirt (I couldn’t find the link, but it is available in the stores) and ankle boots (I scored them in summer sales! ), both from H&M. 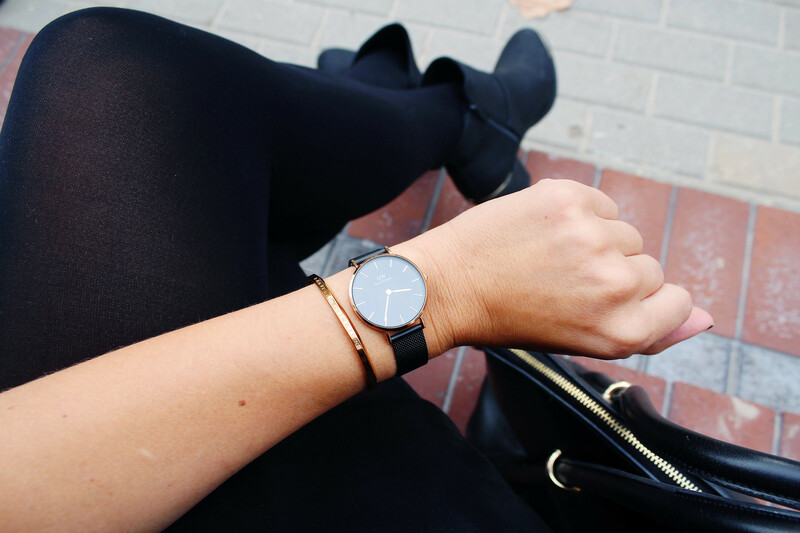 And, of course, I couldn’t not mention my newest and favorite accessory – the Daniel Wellington Classic Petite Ashfield watch. 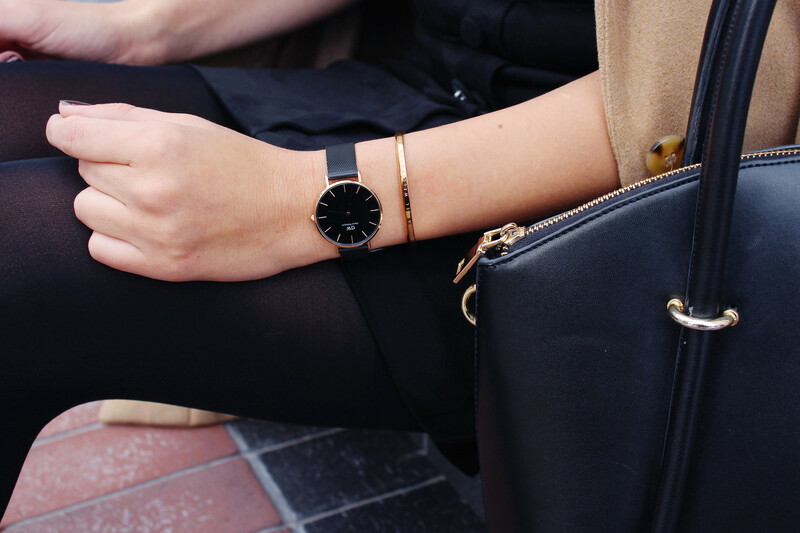 I am completely smitten by the elegant band and the rose gold details – I think it is sooo perfect for fall! If you’d like to buy you Daniel Wellinton watch, use the discount code “CALLME15” and you’ll receive a 15% discount for your whole purchase. The code is valid till the end of the year. Nu ko, pirmais īsti rudenīgais tērps ir publicēts blogā! 🎉 Rudens neapšaubāmi ir atnācis, un to var just ne tikai vēsajā gaisā, bet arī visapkārt dabā – it sevišķi zeltaini sārtajos kokos un krūmos. Likumsakarīgi arī blogā aizsāku rudenīgo outfitu sēriju! Mugurā man ir mans visiemīļotākais rudens kamieļkrāsas mētelis no New Look (alternatīva šeit), jau vairāk nekā 5 gadus veca blūze no Zara (bet vēl joprojām ļoti, ļoti mīļa – man ir bijuši neskaitāmi tērpa ieraksti ar to! Jauninājumi manā garderobē – mākslīgās zamšādas svārki no H&M (linku nevarēju atrast, bet ir jau pieejami veikalos), potīšu augstuma zābaki arī no H&M (nopirku vasaras atlaidēs) un mans šī brīža visstilīgākais aksesuārs – Daniel Wellington Classic Petite Ashfield pulkstenis. Daniel Wellington pulksteņi kā jau jūs to zināt ir mani absolūtie favorīti un šis, protams, nav izņēmums. Elegantā siksniņa un rozā zelta detaļas ir ideāli piemērotas šim rudenim. Ja arī Tu vēlies Daniel Wellington pulksteni, izmanto atlaižu kodu “CALLME15” un saņem 15% atlaidi savam pirkumam. Kods ir derīgs līdz gada beigām. I am so excited for fall fashion!! This coat is so perfect, I love the color! 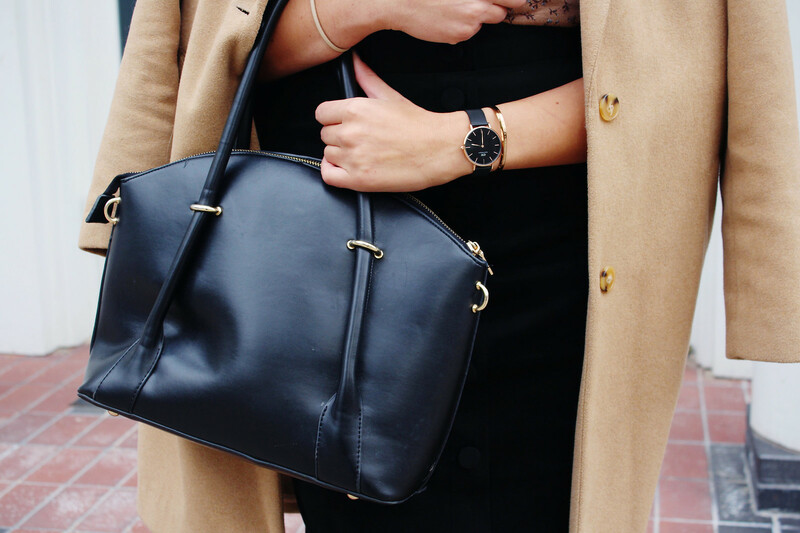 I love any outfit that has a camel coat in it -This look is definitely one of my favorites!! Blog is down until tomorrow, I hope ! Maintenance..
YAY! Finally fall! Actually it is impossible to wear even a coat right now in Barcelona but I'm waiting impatiently for the season! Love how you create an elegant and classic outfit but with an edgy twist adding those earrings! All the best and enjoy the season!